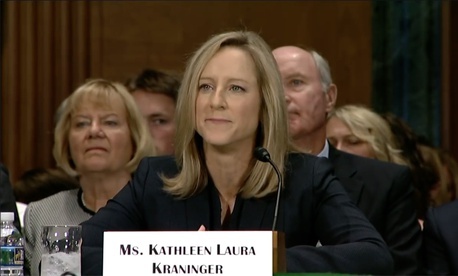 Kathy Kraninger, the White House homeland security specialist who is President Trump’s nominee to be permanent director of the Consumer Financial Protection Bureau, moved a step closer to confirmation on Thursday in a cliffhanger vote. The Senate voted 50-49 along party lines to end debate on her nomination, which had cleared the Senate Banking, Housing and Urban Affairs panel last August in a similarly close tally. The action sets up a final vote during the Senate’s already crowded schedule for next week. During floor debate on Thursday, Crapo added,” I know some of my colleagues on the other side of the aisle have been frustrated by the bureau under acting director [Mick] Mulvaney’s leadership. Given the changes at the agency over the last year . . . now is an appropriate time to reconsider the fundamental structure of the bureau.” That, in Crapo’s view, would mean creating a bipartisan commission instead of a single director, a congressional funding mechanism (rather than the Federal Reserve), and giving the bureau its own inspector general. Sen. Catherine Cortez-Masto, D-Nev., on the floor called Kraninger “unqualified to lead the agency,” saying her comments last August showed that she seems “handpicked to undermine the agency’s mission” and that “her main goal is be a faithful disciple to Mick Mulvaney,” the White House budget director who has been doubling as acting CFPB director. It said the director's office has grown by 14.7 percent, while overall staffing has declined by 2.4 percent.